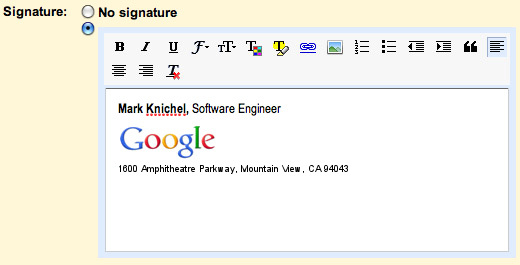 After a good amount of user feedback, Google has finally introduced the feature of being able to create rich text signatures in Gmail. 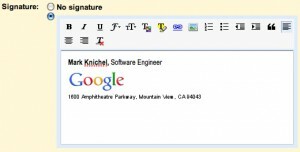 There had been complaints about the original text signature feature, like the inability to change text color or size or insert images or links. Up until now, users have had to resort to using Greasemonkey scripts, browser plug-ins and Google Labs to use extra features. With this latest update, however, users will no longer have to hassle with 3rd party tools since it’s now natively built into Gmail. Users now have access to a rich text editor, similar to the one available when editing outgoing mail. Apart from finally being able to change the font size and color, users will also be able to format text: bulleting, numbering, indenting, and aligning text. Users can also insert images (through a URL) and hyperlinks into personal signatures, adding an additional creative aspect to the feature. To access the features, simply go to Gmail settings then scroll down to the personal signature box which has the new text editor tool. As a whole, these rich text signatures have all the attributes of an online business card. Whether it’s for casual or formal correspondence, it’s nice to have the ability to present your personal information briefly and creatively. 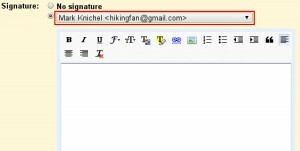 In addition to the rich text signatures, Gmail now supports the creation of custom signatures for the different email addresses associated with the same account. This means that if you use a custom “From:” address to send mail, you’ll be able to choose which email address’ signature you want to edit. You can choose which signature to edit by selecting from a drop down list right above the signature-editing box. You can only select an account’s signature to edit if you’ve imported your other email addresses to the account. This new feature is fairly appealing, as you can deal with personal and work signatures for emails from a single inbox. An email address associated with a business can use a signature tailored to those professional needs, whereas a personal email address can have a signature appropriate for casual correspondents. While many of these features should’ve been introduced long ago, it’s nice to finally be able to create a personal signature that has a business card-like look to it. As of now, the mobile version still only supports plain text signatures. It’s somewhat surprising that the Gmail team still hasn’t released rich text signatures for mobiles, given the rapid growth of Android and increased use of mobile email. Hopefully Gmail is not just working on porting the same features but is in fact adding to them, as they would be very convenient to be able to use on a smart phone. ya this really gr8 & 1 of the most demanded feature in gmail..
but i hav ques.. is it not availabe for Gmail Apps. ? ?